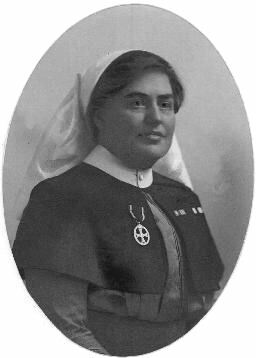 Mabel Mary Tunley,Matron QAIMNS, RRC and Bar, MM One of the most decorated of military nurses to serve during the Great War. She received the Military Medal for her actions during a bombing raid at Bethune on August 7th, 1916. Also served during the Boer War, receiving both the Queen’s and King’s South Africa Medals. The picture was taken from this page on Sue Light’s Scarletfinders website: Thanks Sue. Mabel Mary TUNLEY was born 10 July 1870 in Pontypridd, South Wales, the daughter of Charles William Tunley, a schoolteacher, and his wife Louisa (née Smith). She trained as a nurse at Leeds General Infirmary between 1896 and 1899, and soon after the completion of her training served with Princess Christian’s Army Nursing Service Reserve in South Africa during the Boer War. She was appointed to Queen Alexandra’s Imperial Military Nursing Service as a Staff Nurse in March 1903, rising to become an Acting Principal Matron in France and Flanders during the Great War. At Bethune, on the 7th August 1916, she did exceptionally good work in assisting getting all the patients, 260, down to the cellars, so that when the Clearing Station was eventually hit not one of the patients received a scratch. Her cheeriness and courage were instrumental in keeping everyone who came in contact with her up to the mark. She was slightly wounded and remained at duty. See also information about her Military Medal here. She retired from the service in July 1925, and died in Hull in September 1932 from complications of diabetes. Her father was Mr. C.W. Tunley who was for many years headmaster of the old Wesleyan Day Schools in Hickman Street, Gainsborough in Lincolnshire. Most of the information above was kindly provided by Sue Light but I am indebted to Peter Bradshaw for the Gainsborough connection and for the information below. Her name appears on a memorial in the Royal Garrison Church of All Saints in Aldershot, the ‘home’ church for the Anglican Military Personnel serving in Aldershot. Mabel Tunley’s name is near the bottom of the memorial. Acting Principal Matron Helena Hartigan RRC (shown on the memorial as ‘Sister’). See her page on Edie’s website here. 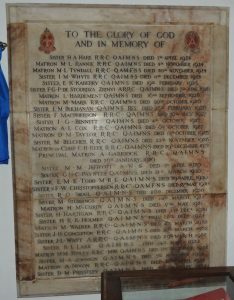 Matron Jessie Hume Congleton RRC (shown on the memorial as ‘Sister’). See her page on Edie’s website here. See the names index for dates on which Mabel Tunley is mentioned in Edie’s diaries.